After yet another early morning wake-up call, Bob and I found ourselves fed and watered by 9 a.m., ready for exploration. 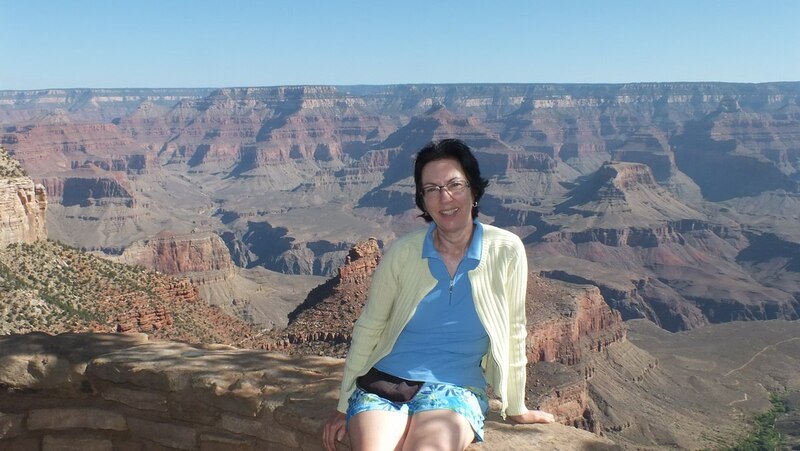 We enjoyed breakfast at El Tovar Hotel on the South Rim of Grand Canyon National Park, then meandered along the South Rim Trail and investigated Grand Canyon Village. 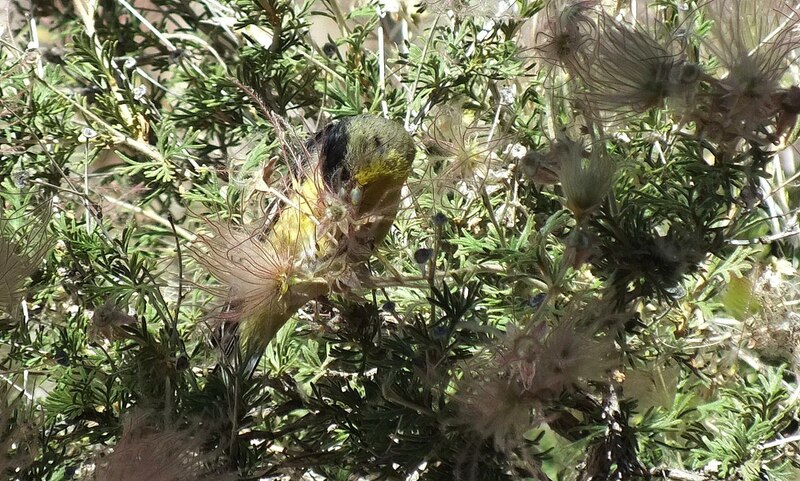 It was there that Bob and I came upon a Lesser Goldfinch (Carduelis psaltria) nestled in amongst the feathery styles of an Apache Plume plant (Fallugia paradoxa). We seldom slept in while staying at Maswik Lodge because tourists in adjoining rooms inevitably were up at the crack of dawn in preparation for white water rafting, helicopter rides, or mule trains. Their early stirrings were like an alarm clock for ourselves, prodding us to get up and out during the cooler temperatures of the day. 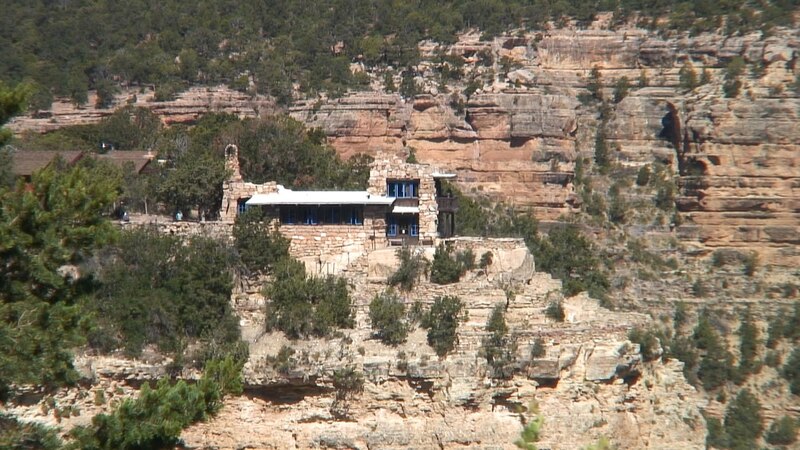 Grand Canyon Village is situated on the South Rim of the Grand Canyon, and the South Rim Trail follows the contours of the canyon edge, going both directions from the village for long distances within Grand Canyon National Park. 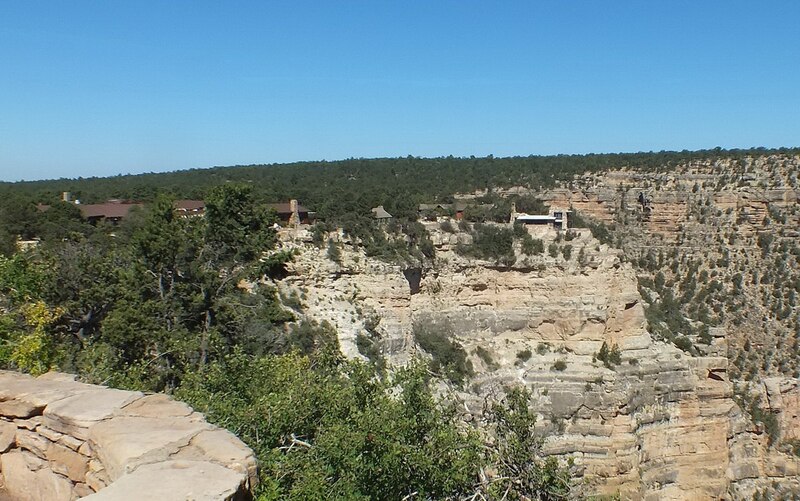 The trail is readily accessible, and visitors can enjoy the panoramic views of the canyon from every point along the trail. Lookout Studio is located very near Bright Angel Lodge, and it was in the vicinity of that historic building that Bob and I caught sight of a Lesser Goldfinch. 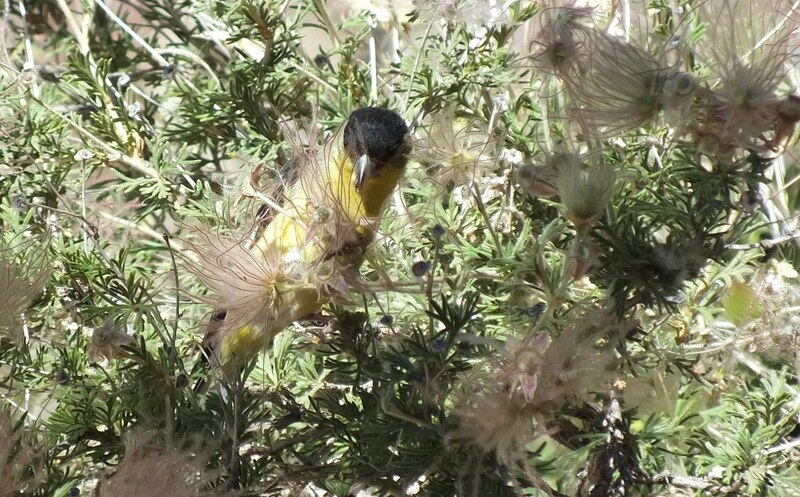 Lesser Goldfinches mainly eat seeds, and as we observed this male, he constantly extracted seeds from the frothy heads and then used his bill to pry open the outer coverings. 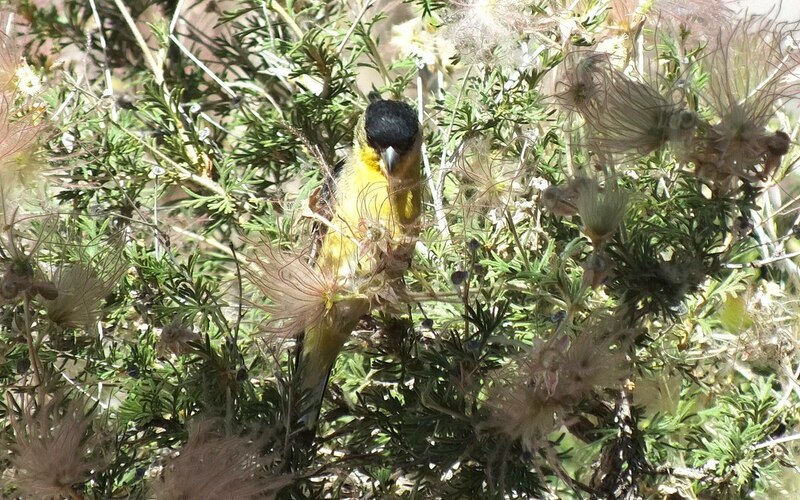 This species of goldfinch prefers to forage in weedy fields, budding treetops, and the brush of open areas, feeding on the flowers, buds or fruits. Lesser Goldfinches are the smallest Carduelis finch in all of North America, and widely thought to be the smallest true finch in the world. There are two distinct subspecies of Lesser Goldfinches in North America. 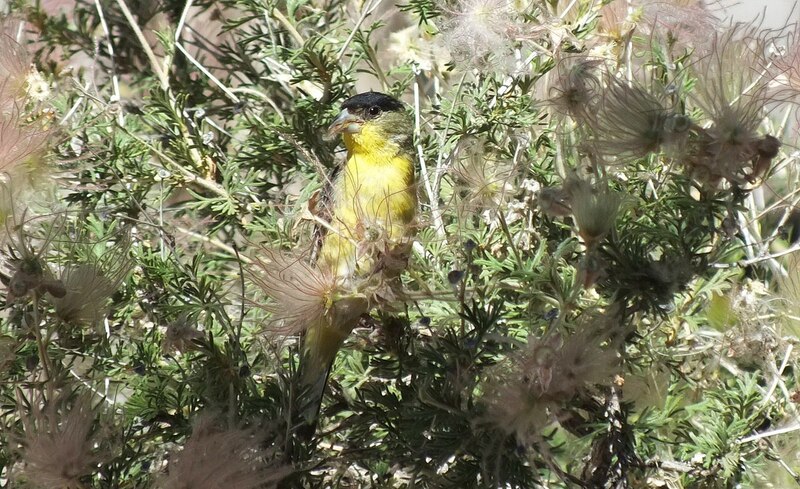 The green-backed, seen here, is more widespread in the far western United States and northwestern Mexico, whereas the black-backed breeds from Colorado to southern Texas. A breeding male differs significantly depending on the subspecies. 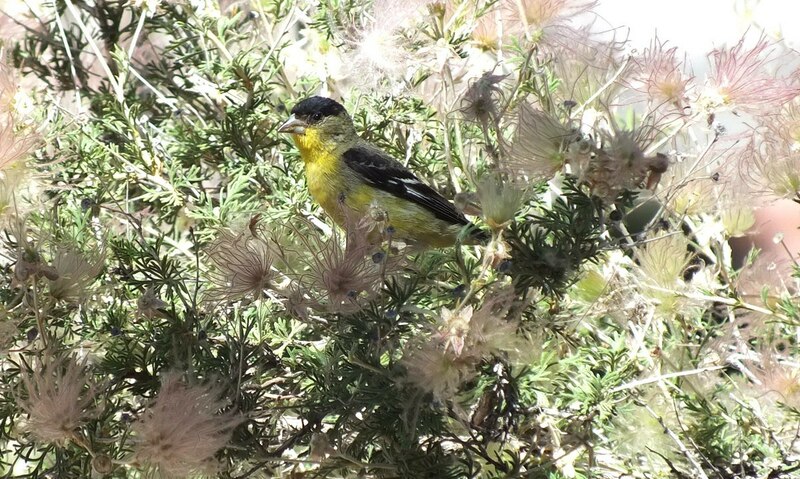 A male green-backed Lesser Goldfinch has bright yellow underparts and a black cap that contrasts with its olive-green back whereas the male black-backed Lesser Goldfinch has entirely black upperparts. 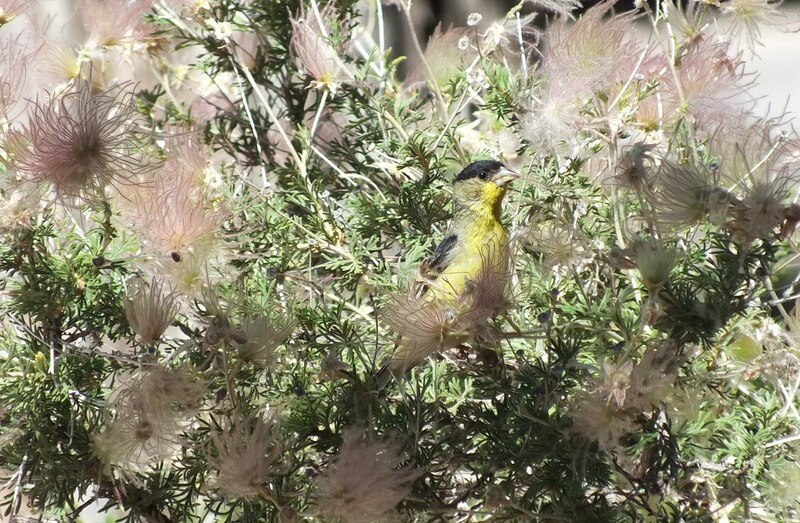 Lesser Goldfinches thrive in a variety of habitats across different elevations, such as arid lowlands to alpine forests…mountain canyons to desert oases. It all depends on the availability of a food source. 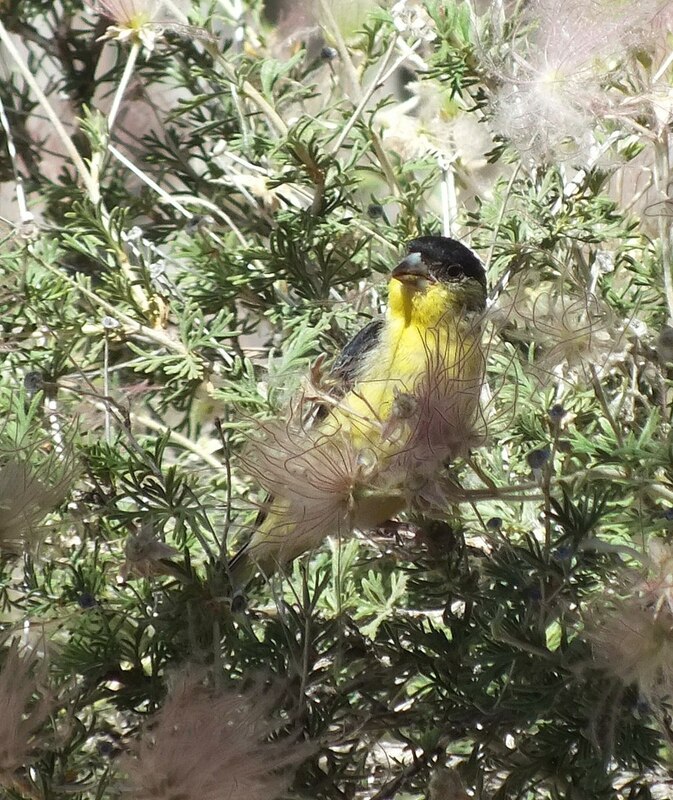 It is common for Lesser Goldfinches from the northern reaches of their range to migrate further south, even into Mexico, however, as a species, Lesser Goldfinches exist all the way south to the Andes Mountains in Peru. 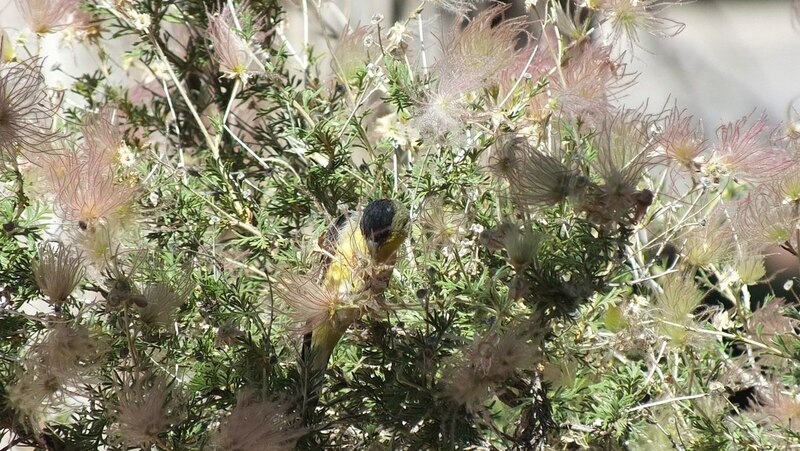 Bob and I were afforded a good look at this goldfinch because the Apache Plume plant happened to be growing behind one of the cottages of Bright Angel Lodge. Few people ventured off the main Rim Trail, so it was quiet and peaceful in the little corner tucked away from the beaten path. Secreted in amongst the pale pink styles of the Apache Plume, the Lesser Goldfinch seemed to hover while constantly jerking its tail. 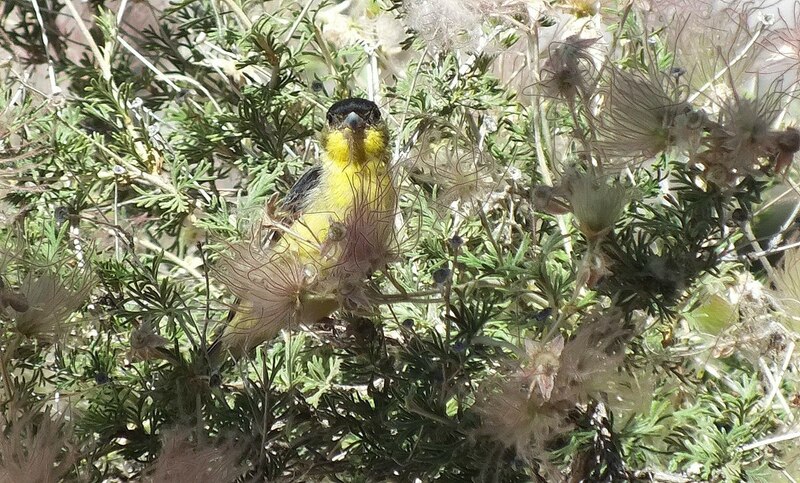 For both of us, the active little bird was like a ray of sunshine – bright and showy. That Goldfinch is so beautiful, I love their colouring. thanks for your comment, Renee. They are quite similar to our northern species, the American Goldfinch, but I think the American Goldfinch is a bit more showy with its bright yellow back.